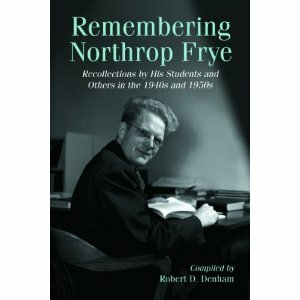 We are writing in order to let you know of our recent publication, Remembering Northrop Frye: Recollections by His Students and Others in the 1940s and 1950s by Robert D. Denham. Details about the book may be found in the following link: http://www.mcfarlandpub.com/book-2.php?id=978-0-7864-6069-4 . Should you wish to have additional information, please contact us and we’ll be glad to help. This entry was posted in Frye as Teacher, News on November 29, 2010 by Michael Happy.